A monitoring and evaluation framework is an important tool to set up a programme in a way that it can be more easily monitored and evaluated. This framework, should be accompanied by a plan that articulates the actual monitoring and evaluation processes that will be undertaken throughout the programming cycle. The plan should be developed during the planning and design phase of an initiative and provide an overview of what will be monitored (based on the programme framework); when monitoring will take place; the tools and resources that will be used in the process and the baseline data that will be collected against which the outcomes and impact of interventions can be measured. The monitoring and evaluation framework is important to illustrate the linkages between programme inputs, outputs and outcomes and may be structured in different ways to reflect the individual shelter characteristics. Importantly, the framework should include a theory of change. A theory of change for shelter programmes explains the logic of how specific activities or the approach is envisioned to contribute to the particular outcome or result the organization seeks to achieve. This theory of change accompanies a logical framework which articulates the pathways to this change and how they will be measured. Project Superwomen was a collaborative initiative between a social service provider, a non-profit employment training center and a shelter provider in New York City. The project was established to assist women survivors of domestic violence in obtaining the type of employment that would keep them out of poverty and off public assistance, while providing them with stability and upward mobility. The initiative engaged evaluators, ActKnowledge and the Aspen Institute Roundtable on Community Change, to assist with the development of a theory of change. In following this process, the team was able to construct a diagram demonstrating the logic behind how change would occur. 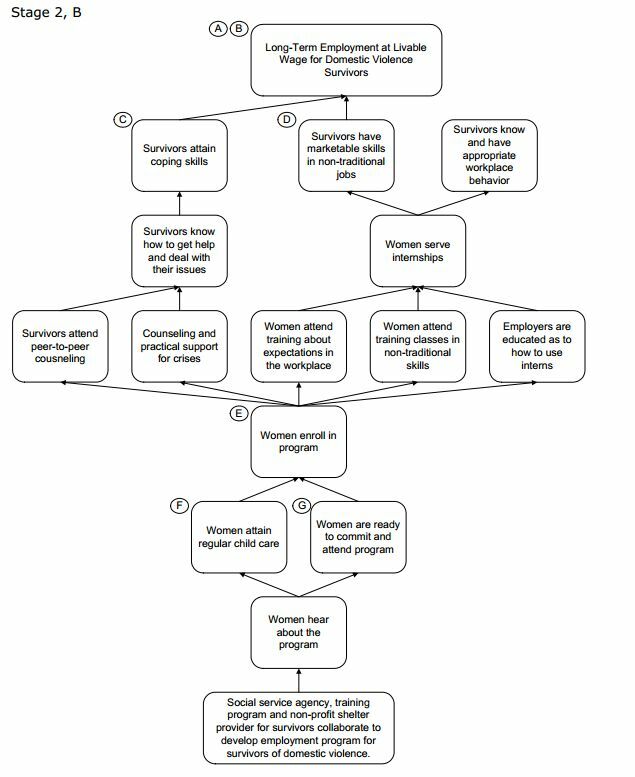 The diagram below illustrates the resulting pathways to ensuring women survivors achieve long-term employment at a livable wage. To read more about the process, access the full document in English. Funding–provided by local governments, community foundations, federal organizations or private donors. Staff –including shelter reception or front-line staff, relief staff, volunteer coordinators or supervisors, administrators and managers. Volunteers – including those who engaged in various boards and committees and those who support services through donation management or transportation. Facilities – including the physical shelter infrastructure, office space and equipment. Definition of the outputs, or what the inputs and activities will produce/yield. Definition of the outcomes, or what is expected to change as a result of the inputs, activities and outputs.